Nearly 40 kids ages 9–17 living with Type 1 diabetes and being treated at the Joslin Diabetes Center in Boston recently had the opportunity to meet with superstar Nick Jonas, then attend his Future Now Tour concert, in suites donated by the TD Garden. Jonas was diagnosed with Type 1 himself at age 13 while on tour with former band The Jonas Brothers. Achieving tremendous success while managing the condition, Jonas now helps spread a positive message about living with Type 1 diabetes through his nonprofit organization Beyond Type 1, as well as through special appearances like the Joslin event. 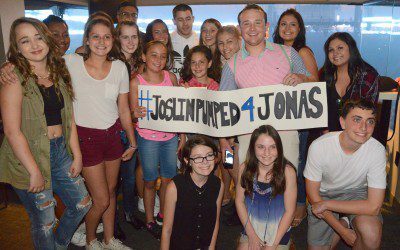 Before attending the concert, the adolescents had the chance to talk with Jonas about their experiences living with Type 1 diabetes. He inspired his fans with a message that hard work and dedication will allow you to manage the condition and do what you want in life. The oral diabetes medicine Synjardy has received approval for a new indication. Bookmark DiabetesSelfManagement.com and tune in tomorrow to learn more.